Wineries with restaurants know that serving food is a sure way of doubling cellar door sales. So the latest Winelands trend isn’t surprising: gourmet picnics on scenic lawns or tranquil outdoor spaces with tables and chairs. Kids can run around without bothering anybody so it’s a no-brainer. Over the past few months I’ve tried a lot of gourmet picnics while compiling a guide to the Winelands for Getaway. 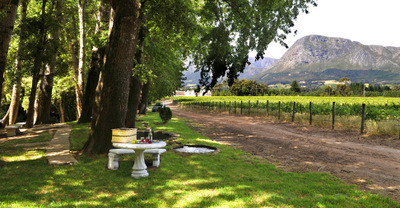 Some Franschhoek suggestions appeared in WINE, and a few Winelands suggestions should be published in Indwe in March 2010 - picnics and picnic wines being the theme. Please send me feedback about others you’ve tried. Franschhoek options include Mont Rochelle Hotel and Country Vineyards blankets offer comfy settling alongside the dam or tables in the gardens. Three choices range from the Country Basket (R290 for two), Gourmet Basket (R370 for two) or Deluxe Basket (R450 for two), depending on whether you’re wanting basic country fare, or a gourmet fill of Franschhoek trout, Tiger prawns, shucked oysters and petit fours at the deluxe end. Children under 12 at R85pp. Tel 021 876 2770, Mont Rochelle. At Allée Bleue Wine Estate picnic baskets collected from the picnic gazebo are eaten off white tablecloths under ancient oaks. Baskets filled with terrines, cheese and sandwiches to avocado Ritz serve two (R145pp) and include a vegetarian option. Children at R80pp. Tel 021 874 1021, Allee Bleue. At Rickety Bridge you can play boules amongst the vines, and then picnic on a small patch of lawn or at tables on the restaurant’s small downstairs deck. It’s a lovely environment but the deck isn’t great as a romantic spot because picnickers are in full view of restaurant guests. This gourmet picnic experience (R135pp) includes delicious sticky wings to prawn-and-cucumber skewers. Tel 021 876 2129, Rickety Bridge. Solms-Delta’s Fyndraai restaurant offers blankets and baskets stocked with farm veggies, tandoori chicken, trout and homemade bread (a bottle of Lekkerwijn Rosé is also included). Find a forested spot along the Dwars River to enjoy the spread. Baskets for two R120pp, children R75pp. Tel 021 874 937, Solms-Delta. At Klein Genot picnic baskets (R128pp) are enjoyed at 20 designated spots on oak-lined Franschhoek River banks with vineyard views. Tel 021 876 2738, Klein Genot.